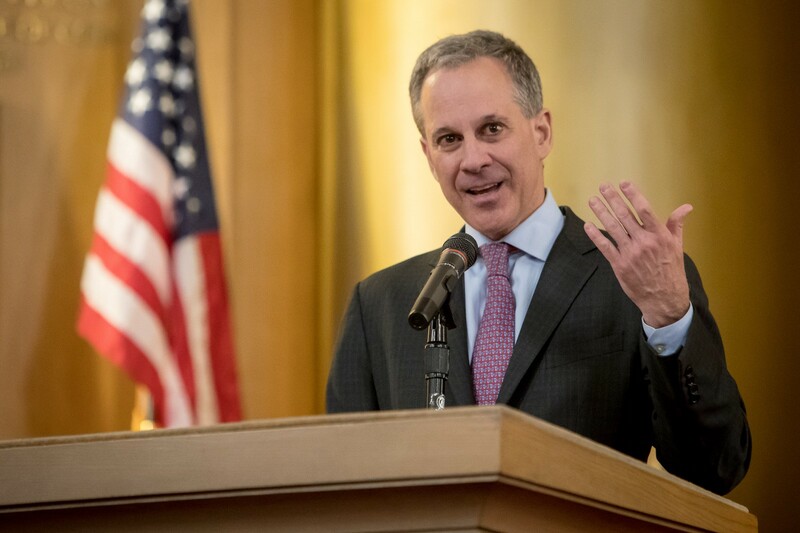 Since November 2016, New York State Attorney General Eric Schneiderman (“OAG”) Has Filed Over 100 Official Acts and Legal Challenges To Protect New Yorkers From Washington’s Harmful Agenda. Consumer and Investor Protection (Martin Act Preemption): On November 17th, OAG issued a statement emphasizing the importance of state Blue Sky laws, especially the Martin Act — following reports that the Trump transition team was considering legislative and policy proposals to dismantle these anti-fraud measures. Civil Rights (Hate Crimes Guidance): On November 17th, amid a rise in hate incidents across the nation, OAG issued an urgent bulletin to local law enforcement officials statewide to provide guidance in identifying and prosecuting hate crimes. Civil Rights (Education): On November 18th, OAG and State Education Commissioner MaryEllen Elia sent a letter to school districts with guidance clarifying protocols to ensure schools remain safe havens where students are free to learn without fear of discrimination, harassment or intimidation directed toward students and employees as a result of their race, ethnicity, religion, immigration status, disability, sexual orientation, gender identity, or any other basis. Civil Rights (Immigration): On November 22nd, OAG issued a fraud alert on immigration scams amid post-election reports of a rising number of immigration services fraud by scammers preying on immigrants’ fears. Voting Rights: On December 6th, OAG issued a report examining widespread voter complaints received before, during, and after New York’s April 2016 presidential primary. In tandem with the report, OAG also proposed the 2017 NY Votes Act — a comprehensive bill to reform the State’s voting systems. Environmental Protection and Labor: On December 7th and 8th, OAG issued statements criticizing President-elect Trump’s nominations of Scott Pruitt to lead the EPA and Andrew Puzder to serve as Labor Secretary. Both statements reiterated OAG’s commitment to take action against any anticipated federal rollback of environmental or labor protections. Andrew Puzder ultimately withdrew his nomination. Civil Rights: On December 21st, OAG called on President Obama to dismantle the discriminatory Bush-era NSEERS registry to prevent the creation of the unconstitutional Muslim registry that President-elect Trump had supported. On December 22nd, OAG released a statement commending President Obama for his decision to dismantle NSEERS. Environmental Protection (Clean Power Plan): On December 29th, OAG led a broad coalition of 19 states and localities in calling on President-elect Trump to continue the federal government’s defense of the Clean Power Plan, urging him to reject “misguided advice” from a group of attorneys general led by West Virginia to discard the plan. Healthcare (Reproductive Rights): On January 11th, on the eve of the Trump administration, and as Congressional Republicans moved to repeal the Affordable Care Act, OAG re-introduced “The Comprehensive Contraception Coverage Act of 2017” (CCCA), legislation aimed at protecting and enhancing New Yorkers’ access to cost-free contraception. The CCCA passed the Assembly in mid-January. OAG issued a statement. Civil Rights (Immigration: Sanctuary Cities): On January 19th, OAG announced guidelines on sanctuary jurisdiction policies that provide a legal roadmap for local governments and law enforcement agencies that seek to limit interaction with federal immigration authorities. On January 25th, President Trump signed an immigration enforcement Executive Order that, among other things, called for the withholding of federal funds to jurisdictions that have adopted sanctuary policies. OAG issued a statement that day in response. On March 12th, OAG updated its legal guidance to support local governments and law enforcement agencies in protecting vulnerable immigrant communities to make clear President Trump’s policies do not change local government’s right to protect their immigrant communities by codifying “sanctuary” policies into local laws. On April 25th, OAG issued a statement welcoming the preliminary injunction issued that day by a federal judge blocking President Trump’s Executive Order on sanctuary cities. On May 17th, OAG released a joint report with Attorneys General from CA, OR, RI, WA, and DC that debunked the Trump Administration’s bogus legal and public safety claims against cities and towns that choose to limit their participation in the most aggressive forms of federal immigration enforcement. On May 22nd, AG Sessions issued a memo conceding that the President’s Interior E.O. could not grant a wholesale withholding of all federal funds as a result of a jurisdiction’s status as a “sanctuary jurisdiction.” OAG issued a statement. Criminal Justice Reform and Environmental Protection: On January 18th, OAG & a coalition of AGs sent letters to Congressional leaders opposing the nominations of President Trump’s pick for Attorney General, Jeff Sessions, and for Administrator of the EPA, Scott Pruitt. Environmental Protection: On January 19th, OAG filed a motion in the D.C. Circuit seeking to intervene in support of the EPA’s Cross-State Air Pollution Update Rule, which requires power plants in 22 states to significantly reduce smog pollution that blows into downwind states like New York and, as a result, threatens public health. In April 2017, the D.C. Circuit agreed to hold the case in abeyance, following a request from the Trump Administration DOJ, but have asked EPA for regular status updates on its review of the ozone/smog measures. Consumer Protection: On January 23rd, OAG joined a group of 16 AGs (led by CT AG Jepsen) in filing a motion to intervene in the D.C. Circuit case considering the CFPB’s independent-agency structure — PHH Corporation, et al. v. Consumer Financial Protection Bureau. Consumer Protection (For-Profit Schools): On January 25th, OAG joined five other attorneys general in filing a motion to intervene in a federal district court case against the Accrediting Council for Independent Colleges and Schools (ACICS), an accreditor of for-profit colleges, following the DOE’s decision to terminate ACICS recognition as an accreditor. States intervened to protect consumers in their states, who rely on federally-recognized accreditors to ensure that colleges offer quality education and protect against abusive practices. On January 28th, OAG issued a statement applauding the stay order by Judge Donnelly of the Eastern District of New York. On January 29th, OAG organized a 16-AG statement of opposition to the first Muslim Ban E.O. On January 29th, OAG called on DHS and CBP to demand a list of all individuals that were being detained at JFK pursuant to the Muslim Ban E.O. On January 31st, OAG announced it would join an EDNY lawsuit filed by the American Civil Liberties Union Foundation and others challenging Trump’s travel ban executive order. On February 2nd, OAG officially filed suit to join the federal lawsuit. OAG ultimately removed itself from the EDNY case and joined the litigation brought by Washington and Minnesota in the 9th Circuit. Civil Rights & Immigration (Travel Ban): On February 6th, OAG led an 18-AG coalition in filing an amicus brief in support of Washington and Minnesota’s challenge to the Travel Ban in the Ninth Circuit; OAG also filed a similar amicus brief in the Eastern District of Virginia. Environmental Protection (Methane): On February 7th, OAG sent a letter (signed onto by six other AGs and a number of state environmental regulators) to U.S. Senate leadership urging them to oppose a Congressional Review Act resolution to void methane gas safeguards. The BLM (Bureau of Land Management) methane rule at issue was vital to controlling the leaking, venting, and flaring of methane (a potent climate change pollutant) from oil and natural gas developments on public lands managed by the BLM. The CRA resolution failed in the Senate in May. Civil Rights (Immigration): On February 15th, OAG issued an urgent fraud alert, warning immigrant communities of potential scams in light of recent reports that individuals have been posing as Immigrations and Customs Enforcement (ICE) agents and demanding money from victims in order to avoid deportation. Environmental Protection (Clean Water Act): On February 15th, OAG sent a joint letter with 10 AGs to Senators Mitch McConnell and Charles Schumer strongly urging opposition to the Commercial Vessel Incidental Discharge Act legislation that would dramatically weaken clean water protections by preventing New York and other states from limiting the discharge of biological pollution by commercial shipping vessels into their waters. Voting Rights: On February 22nd, in response to a Congressional inquiry from Democratic House members Elijah Cummings (Ranking Member, Oversight and Government Reform), Bob Brady (Ranking Member, House Administration), and James Clyburn (Assistant Democratic Leader), and amid false accusations on voter fraud from the President, OAG sent a letter clarifying that there was not a single substantiated claim of voter fraud in New York last year. Consumer Protection (Student Loans): On February 22nd, OAG joined with Illinois AG Madigan and a broad coalition of fellow Attorneys General to send a letter to the U.S. Department of Education Secretary and Congressional leaders expressing their continued support of recent federal protections for student borrowers. Civil Rights (Transgender Students): On February 22nd, OAG issued a statement denouncing the Trump administration’s action to rescind anti-discrimination protections for transgender and gender nonconforming students. On February 23rd, OAG sent a letter with NYS Education Commissioner MaryEllen Elia reminding school districts across New York State that — irrespective of the federal government’s decision — they have independent duties under state and local law to protect transgender students from discrimination and harassment in their schools and at all school functions. Civil Rights (Immigration): On February 27th, OAG and State Education Commissioner MaryEllen Elia issued an additional guidance to school districts reminding them of their duty to comply with existing state and federal laws that ensure the rights of immigrant children to attend New York’s public schools without fear of reprisal. Environmental Protection (Waters of the U.S. Rule): On February 28th, OAG issued a statement on behalf of the AGs from D.C., Hawaii, Massachusetts, Oregon and Vermont reiterating its support for defending the Waters of the U.S. Rule, which clarifies the scope of waters protected under the Clean Water Act — the Trump Administration opposes and is seeking to rollback (via an Executive Order). The Rule is stalled in litigation at the Supreme Court (where OAG is an intervenor-defendant). After the Trump Administration issued an E.O. calling for the rewriting and extreme narrowing of the rule, DOJ asked the Supreme Court to hold the case in abeyance, which the Court denied to do. Civil Rights (Transgender Students): On March 3rd, OAG led a 19-AG coalition (with AG Ferguson) in filing an amicus brief with the U.S. Supreme Court, in support of a transgender student — known as G.G. — who is suing the Gloucester County School Board for discrimination on the basis of gender identity. After briefs were submitted, the Supreme Court sent the case back to the Fourth Circuit for reconsideration. On May 16th, OAG led a coalition of 18 Attorneys General in filing an amicus brief with the United States Court of Appeals for the Fourth Circuit, in support of G.G. Civil Rights (Immigration: Muslim/Travel Ban): In early March, President Trump issued a revised Travel Ban Executive Order. On March 9th, OAG announced he’d join the challenge by Washington State’s lawsuit in the Western District of Washington and subsequently withdrew from its challenge to the first E.O. in the EDNY. On March 13th, OAG officially filed suit, joining the challenge by the Washington State AG to the second, revised Travel Ban E.O. OAG also worked with a coalition of AGs to file amicus briefs supporting challenges in Hawaii and Maryland. On March 15th, OAG issued a statement applauding the order by Judge Watson of the federal District Court of Hawaii regarding the immigration ban. Environmental Protection (Fuel Efficiency Standards — EPA): On March 15th, OAG announced that it would lead a coalition of states to intervene in a lawsuit in support of the current vehicle emission standards (a significant source of air pollution) in the U.S. Court of Appeals for the D.C. Circuit, where the Alliance of Automobile Manufacturers had filed suit against the standards. Environmental Protection (Energy Efficiency Standards I): On April 3rd, OAG, leading a coalition of 9 AGs, the Pennsylvania Department of Environmental Protection, and the City of New York, filed a 60-day notice with the Trump Dept. of Energy (DOE) for violating the requirements of the Energy Policy and Conservation Act (EPCA) by failing to publish final energy efficiency standards for portable air conditioners, uninterruptible power supplies, air compressors, walk-in coolers and freezers, and commercial packaged boilers. On June 13th, OAG’s coalition sued over DOE’s failure to publish in the Federal Register final energy efficiency standards for the four categories: portable air conditioners, uninterruptible power supplies, air compressors, walk-in coolers and freezers and commercial packaged boilers which violated the EPCA and APA. On July 10th, DOE announced that it would publish final standards for walk-in coolers and freezers. Environmental Protection (Energy Efficiency Standards — Ceiling Fan Rule): On April 3rd, OAG, leading a coalition of 11 states, filed a lawsuit against the Trump administration’s DOE for improperly delaying the effective date of an Obama-era energy efficient ceiling fan rule — these delays violated both the federal Energy Policy and Conservation Act (EPCA) and the Administrative Procedure Act (APA). On May 24th, the DOE published a notice in the Federal Register ending a delay in adopting energy efficiency standards for ceiling fans by confirming that the effective date for those standards will be September 30, 2017. OAG issued a statement. Environmental Protection (Clean Power Plan): On April 5th, OAG and a coalition of AGs filed opposition to the Trump administration’s request to delay court proceedings regarding the Clean Power Plan in the U.S. Court of Appeals for the D.C. Circuit. The coalition argued that the plan is firmly founded in both science and the law, and built upon strategies New York and other states have used to successfully cut power plant emissions. In late April 2017, the D.C. Circuit issued an order temporarily suspending the litigation while calling for briefing on whether to hold the case in abeyance or remand the rule to EPA. OAG filed a brief in May 2017, supported by the multistate coalition, arguing against abeyance and for a remand to the Agency, which would terminate the Supreme Court’s temporary stay of implementation of the rule pending litigation. Healthcare (Reproductive Rights): On April 6th, OAG led a coalition of 16 AGs in filing an amicus brief with the U.S. Court of Appeals for the Sixth Circuit, challenging an Ohio state law that would defund Planned Parenthood and other health service providers that perform or promote abortions. The case is Planned Parenthood of Greater Ohio v. Richard Hodges. Consumer and Investor Protection: On April 18th, OAG submitted a public comment letter urging the Department of Labor to resist the Trump Administration’s efforts to kill the Fiduciary Rule, an investor protection regulation that would require financial advisors to disclose conflicts of interests and to act in their clients’ best interest — rather than their own. Healthcare (ACA Replacement): On April 21st, OAG joined a coalition of 20 AGs in a letter opposing the Trump Administration’s efforts to scale back funding for drug use prevention and addiction treatment originally included in the Affordable Care Act. Consumer Protection (Student Loans): On April 24th, OAG joined a coalition of 21 AGs and the Office of Consumer Protection of Hawaii in a letter calling out the U.S. Department of Education for abdicating its responsibility to millions of student loan borrowers and their families across the country by revoking critical reforms designed to help students avoid default and curtail loan servicer misconduct. Environmental Protection (Paris Climate Agreement): On April 25th, OAG joined a coalition of 14 AGs in writing a letter urging the Trump Administration to reconfirm the United States’ commitment to the Paris Climate Agreement. Environmental Protection: On April 26th, OAG led a coalition of 16 AGs urging Congress to reject the rollback of critical ozone air quality standards. The AGs detailed in letters their opposition to the Ozone Standards Implementation Act of 2017, which would substantially delay the ozone standards promulgated by the EPA in 2015 — marking a major step backwards in efforts to combat pollution and its negative impact on public health. Healthcare (Reproductive Healthcare): On May 1st, OAG joined a coalition of 16 states in filing an amicus in the Eleventh Circuit supporting a challenge to an Alabama law that requires doctors to perform abortions in a way that imposes undue health risks on the women undergoing these procedures. Healthcare (ACA Replacement): On May 4th, following House passage of the American Healthcare Act (AHCA), OAG issued a statement calling into question the Act’s constitutionality and threatening suit should it ever become law. Healthcare (ACA Replacement): On May 18th, OAG and California AG Becerra led an 18-AG coalition to move to intervene in the ongoing appeal of a lawsuit filed by House Republicans that seeks to undercut the affordability of health insurance plans under the Affordable Care Act (ACA). The case, House of Representatives v. Price, is a legal challenge brought by the Republican-majority House of Representatives to block billions of dollars in Affordable Care Act subsidies that reduce co-payments, deductibles, and other out-of-pocket costs for low-income Americans. OAG’s motion to intervene was granted on August 1, 2017 — see below for further updates. Environmental Protection (Bomb Trains): On May 22nd, through public comments, OAG urged the Trump Administration to immediately close a loophole that allows highly flammable, highly explosive crude oil to be shipped by rail through communities in New York and across the country. These so-called “bomb trains” are responsible for several catastrophic rail accidents in recent years, including the 2013 explosion in Quebec that killed 47 people; in New York alone, these trains cover roughly 700 miles of the state. Environmental Protection (Paris Climate Agreement): On June 5th, following announcement that the U.S. would withdraw from the Paris Climate Agreement, OAG and a coalition of 19 AGs joined forces with governors, mayors, business leaders and universities across the country in pledging (to the We Are Still In coalition) to maintain their commitment to fighting climate change and abiding by the principles of the global agreement. Consumer Protection (Student Loans): On June 5th, OAG joined a coalition of 18 AGs in a letter demanding that the U.S. Department of Education stop delaying its program to cancel federal student loans for thousands of students in New York victimized by predatory for-profit colleges. Environmental Protection (Pesticides): On June 6th, OAG and 7 AGs announced a challenge to the EPA for violating federal law by failing to issue required safety finding on chlorpyrifos, a common pesticide that causes well-documented harms to children’s neurological development. Consumer Protection (CHOICE Act-CFPB): On June 7th, OAG led a coalition of 20 AGs in urging House leadership to reject the anti-consumer Financial Choice Act of 2017 (H.R. 10). H.R. 10 would roll back many of the critical protections adopted in the wake of the financial crisis and, most alarmingly, would gut the Consumer Financial Protection Bureau. Environmental Protection (Fuel Efficiency Standards — EPA): On June 9th, OAG led a coalition of 13 AGs and the Pennsylvania Department of Environmental Protection in warning the Trump Administration that any effort to roll back key vehicle emission standards would be met by a “vigorous” court challenge. Civil Rights (Immigration/Travel Ban): On June 12th, OAG led a coalition of 17 AGs in filing an amicus brief with the U.S. Supreme Court in opposition to President Trump’s Muslim/travel ban. In March, a federal court in Maryland blocked key parts of President Trump’s immigration ban; in May, the Fourth Circuit Court of Appeals had upheld the suspension of the ban. OAG filed subsequent amicus briefs on the Trump administration’s interpretation and implementation of the partial stay of the injunctions entered by SCOTUS. Environmental Protection (Energy Efficiency Standards I): On June 13th, OAG led a coalition of 9 AGs, the Pennsylvania Department of Environmental Protection, and the City of New York, in suing the Department of Energy for failing to publish final energy efficiency standards as required by the Energy Policy and Conservation Act (EPCA) and the Administrative Procedure Act (APA). This action is distinct from OAG’s work to force DOE to finalize the energy efficiency standards for ceiling fans — see the update for this rule in April 2017 above. In July 2017, DOE announced that it would publish final standards for walk-in coolers and freezers. Consumer Protection (Student Loans): On June 14th, OAG joined a coalition of 9 AGs in filing a motion to intervene in California Association of Private Postsecondary Schools (CAPPS) v. Betsy DeVos. The case concerns a challenge to the U.S. Department of Education’s Borrower Defense Regulations, which ensure protection for students who are misled or victimized by for-profit schools. Environmental Protection (Methane I or “New Sources”): On June 20th, OAG joined a coalition of 14 AGs in filing a motion to intervene in Clean Air Council v. Pruitt — in support of a group of plaintiff-environmental organizations seeking to stop the EPA’s stay of a 2016 Obama-era EPA rule preventing emissions of thousands of tons of the potent greenhouse gas methane, smog-forming volatile organic compounds (VOCs), and hazardous air pollutants. Consumer Protection: On June 26th, OAG led a coalition of 12 AGs in writing a letter to U.S Senate leadership expressing “strong opposition” to the proposed Regulatory Accountability Act of 2017 (RAA). In the letter, the coalition expresses concern that the RAA would stop the federal regulatory process thereby removing critical protections for New Yorkers and Americans from toxic chemicals, predatory marketing practices, dangerous labor conditions, unsafe food and drugs, and much more. Civil Rights (LGBTQ): On June 27th, OAG led a coalition of AGs in filing an amicus brief in Zarda v. Altitude Express in the U.S. Court of Appeals for the Second Circuit. The brief argues that Title VII of the Civil Rights Act of 1964 prohibits employment discrimination on the basis of sexual orientation. The case involves a former sky diving instructor who alleged he was fired after disclosing his sexual orientation to a customer. Environmental Protection (Methane II or “Existing Sources”): On June 29th, OAG led a coalition of 15 AGs in notifying the Trump Administration of their intention to sue if the Administration continues to ignore its legal duty to control emissions of methane. Consumer Protection (Student Loans): On July 6th, along with 19 other AGs, OAG sued the Department of Education and Secretary DeVos for rescinding the Borrower Defense Rule. Environmental Protection (Chlorpyrifos): On July 6th. OAG led a coalition of 6 AGs in a motion to intervene in League of United Latin American Citizens et al v. Pruitt in the Ninth Circuit Court of Appeals. The coalition, along with environmental, human health, and farmworker groups, is asking the Court to find that the EPA cannot lawfully continue to allow chlorpyrifos “tolerances”- or permitted residues- on food without finding that they are safe. Civil Rights (Travel Ban): On July 10th, OAG led a coalition of 16 AGs in filing an amicus brief in support of Hawaii’s motion for injunctive relief in federal district court. In early July, Hawaii filed a motion in State of Hawaii and Ismail Elshikh v. Donald Trump, et al. to clarify the scope of the injunction that partially blocks the travel ban. On July 18th, OAG led the same coalition of AGs in filing a new amicus brief opposing the Trump administration’s application to the Supreme Court for clarification and to stay the district court decision that the ban should not prevent grandparents and other close relatives of U.S. residents from entering the country. On July 19th, OAG released a statement following the Supreme Court’s rejection of the Trump administration’s request for clarification. Consumer Protection (Student Loans): On July 13th, OAG joined a coalition of 21 AGs in submitting public comments to Education Secretary Betsy DeVos criticizing the department’s move to replace the Borrower Defense Rule and the Gainful Employment Rule. Civil Rights (Campus Sexual Assault): On July 19th, OAG joined a coalition of 20 AGs in a letter calling on Secretary DeVos to maintain protections for survivors of campus sexual assault, following reports that the Department of Education is preparing to roll back important protections for survivors. Civil Rights (Immigration): On July 21st, OAG joined 19 other AGs in a letter to President Trump urging him to maintain and defend the Deferred Action for Childhood Arrivals (DACA) program. Environmental Protection: On July 24th, OAG led a coalition of 11 AGs in suing the EPA for delaying the Accidental Release Prevention Requirements or the “Chemical Accident Safety Rule.” The rule updated and improved Congressionally-mandated protections against explosions, fires, poisonous gas releases, and other accidents at more than 12,000 facilities across the country — including over 200 in New York — that store and use toxic chemicals. Civil Rights (LGBT Protections): On July 28th, OAG signed a 19-AG letter to the Senate and House Armed Services Committees expressing opposition to the President’s ban on transgender people serving in the Armed Forces. Environmental (Low Income Energy Assistance): On July 31st, as part of a coalition of 35 AGs and state consumer advocate agencies, OAG urged Congress to preserve and expand funding for the Low Income Home Energy Assistance Program (LIHEAP) and Weatherization Assistance Program (WAP) in the 2018 federal budget. Environmental Protection (Ground-level ozone, a/k/a smog): On August 1st, leading a coalition of 16 AGs, OAG filed a lawsuit against the EPA and Administrator Scott Pruitt for illegally stalling the designation of areas impacted by unhealthy levels of ground-level ozone (known as smog) — vital to protecting New Yorkers and other Americans from dangerous pollution. On August 2nd, EPA reversed itself, and ended the illegal delay of the designation of areas impacted by smog — although it remained equivocal on whether it would meet the October 1st deadline. OAG issued a statement in response to this victory. EPA failed to meet its Oct. 1st deadline. On October 5th, on behalf of 14 AGs, OAG filed a statutorily required notice of intent to sue (the Clean Air Act requires a 60-day notice prior to filing a lawsuit). Healthcare (House v. Price and CSRs): On August 1st, OAG issued a statement welcoming the D.C. Circuit’s decision to grant OAG’s motion to intervene in the ongoing litigation over cost-sharing reduction subsidies (CSRs), House v. Price. Immigration (ICE Arrests in Courthouses): On August 3rd, OAG and Brooklyn District Attorney Eric Gonzalez called for the United States Immigration and Customs Enforcement (ICE) to stop conducting raids in New York courthouses — to designate courthouses as sensitive locations — and to recalibrate their priorities so crime victims and witnesses are not targeted for removal proceedings. Immigration (Travel Ban): On August 3rd, leading a coalition of 16 AGs, OAG filed an amicus brief in the Hawaii travel ban litigation, opposing the Trump administration’s appeal of the decision by the district court that the ban should not prevent grandparents and other close relatives of United States residents from entering the country. Environmental Protection (Methane): On August 9th, as part of a coalition of 14 AGs, the State of Colorado, and the City of Chicago — OAG submitted comments in opposition to the EPA’s proposed 27-month delay of a vital rule aimed at preventing tons of methane emissions — a powerful greenhouse gas — from new sources in the oil and gas sector. Environmental Protection (Long Island Sound): On August 17th, OAG and Governor Cuomo announced that New York State had filed a lawsuit against the EPA, challenging its decision to designate a permanent open water disposal site in eastern Long Island Sound for tens of millions of cubic yards of dredged sediments — which would violate the Ocean Dumping Act and Coastal Zone Management Act. Environmental Protection: On August 18th, OAG issued a statement regarding the Second Circuit’s decision to uphold New York State’s denial of a water quality certification for the Constitution Pipeline — a critical win for OAG and the State’s authority to take necessary action to protect its waters and natural resources. Environmental Protection (Clean Power Plan): On August 31st, OAG led a coalition of 20 states and localities in urging the retraction of the EPA’s “legally incorrect” guidance to States regarding Clean Power Plan implementation. In March 2017, Administrator Pruitt sent unsolicited letters to the Governors of 47 states asserting that the Supreme Court’s stay of the Clean Power Plan pending the conclusion of litigation provides states and power companies with “day-to-day tolling” of the rule’s compliance deadlines. Civil Rights and Immigration (DACA): On September 6th, OAG filed a lawsuit on behalf of 16 AGs in the EDNY challenging the Trump administration’s decision (through DOJ and DHS memoranda) to sunset the DACA program over a six-month period beginning on September 5, 2017. Environmental Protection (Fuel Efficiency Standards — DOT): On September 11th, OAG and 4 other AGs filed a lawsuit in the Second Circuit against the Trump Administration (specifically the National Highway Traffic Safety Administration and Elaine Chao in her official capacity as Secretary for the U.S. Department of Transportation) for illegally delaying a rule that encourages automakers to produce vehicle fleets that meet or exceed federal fuel efficiency standards. Civil Rights and Immigration (Travel Ban): On September 19th, OAG led a coalition of 18 AGs in filing an addition amicus brief in the U.S. Supreme Court opposing President Trump’s travel ban (EO-2). The brief was filed in related cases Trump v. IRAP and Trump v. Hawaii, ahead of scheduled arguments. In both cases, the district courts entered nationwide preliminary injunctions prohibiting enforcement of President Trump’s 90-day ban on the entry to the U.S. of nationals from six overwhelmingly Muslim countries, the suspension of the U.S. Refugee Admissions Program, and the reduction of the Program’s refugee cap. Both the Fourth Circuit and the Ninth Circuit affirmed the injunctions. After OAG’s brief was filed, President Trump issued a Proclamation imposing new travel restrictions (and adding the countries of Venezuela and North Korea to the restrictions). Subsequently, the Supreme Court removed the related cases from the oral argument calendar and requested letter briefs from the parties (Hawaii, IRAP, and DOJ) on the question of mootness. Labor (Overtime Pay Rule): On September 26th, OAG led a coalition of 9 AGs in opposing the Trump administration’s efforts to roll back overtime pay protections for hundreds of thousands of New Yorkers and millions of Americans. Consumer Protection (Student Loans): On September 26th, OAG signed on to a 20-AG letter demanding that the Department of Education stop its systematic rollback of critical protections for student loan borrowers. Consumer Protection (PSLF): On September 28th, OAG issued guidance for federal student loan borrowers, who seek to qualify for forgiveness under the Public Service Loan Forgiveness Program (“PSLF”) beginning on the program’s 10th anniversary next month. Environmental Protection (FERC Coal Burning Plants): On September 29th, OAG issued a statement, responding to the U.S. Secretary of Energy Rick Perry’s proposal to mandate that coal-burning power plants be paid higher prices for electricity. Civil Rights and Immigration (DACA): On October 5th, OAG issued an alert for DACA grantees, urging them to protect themselves from scammers seeking to capitalize on the uncertainty created by President Trump’s decision to rescind the program. Civil Rights and Immigration (DACA): On October 5th, OAG and a coalition of 16 AGs and the State of Colorado filed an amended complaint in the Eastern District of New York on DACA. OAG also announced that Warby Parker, Univision, the Partnership for New York City, and the Association for a Better New York (ABNY) filed declarations in support of the lawsuit. Statement re: Federal Rule Weakening ACA Contraceptive Mandate: On October 6th, OAG issued a statement in response to interim final rules issued by the Trump Administration that significantly expand exemptions from the contraceptive coverage mandate under the Affordable Care Act. Statement re: DOJ Religious Freedom Guidance: On October 6th, OAG issued a statement in response to guidance issued by Attorney General Sessions directing federal agency to give maximum accommodation to religious freedom claims, including claims that could affect hiring decisions. Environmental Protection (Clean Power Plan — EPA Agency Action): On October 9th, OAG issued a statement explaining that should the EPA ultimately repeal the Clean Power Plan, New York will sue — this was in response to EPA Administrator Scott Pruitt announcing a proposed rule to rescind the CPP. The proposed rule would rescind, but not replace the CPP with an alternative plan that would meet the legal requirement of limiting carbon pollution from power plants. Civil Rights and Immigration (Travel Ban 3.0): On October 12th, OAG’s coalition filed a motion for a temporary restraining order (TRO) against implementation of the third travel ban (President Trump issued a proclamation to implement a revised travel ban on September 24th), and amended its original lawsuit to include legal challenges to the latest ban. On October 18th, a federal judge in Hawaii blocked the third travel ban. OAG issued a statement. Civil Rights (LGBTQ Rights): On October 12th, OAG led an amicus brief filed with the U.S. Supreme Court by 18 AGs, arguing that employment discrimination on the basis of sexual orientation violates Title VII of the Civil Rights Act. The case is Evans v. Georgia Regional Hospital. Healthcare (ACA Rollback — Executive Order): On October 12th, OAG issued a statement criticizing President Trump’s Executive Order on healthcare, warning that if he violates the law or tramples on New Yorkers’ constitutional rights — OAG will take the Trump administration to court. Healthcare (ACA Rollback — CSR Rescission): On October 13th, OAG announced a new multistate lawsuit filed by 19 Attorneys General in the Northern District of California to defend the health care subsidies on which thousands of New Yorkers and millions of Americans rely. The lawsuit was prompted by the previous day’s Trump administration decision to cut off the Affordable Care Act’s cost-sharing reduction payments (CSRs), which reduce copayments, deductibles, and other out-of-pocket costs for low-income Americans. Civil Rights (Opposition to the Transgender Military Ban): On October 16th, OAG joined a coalition of 15 AGs in filing an amicus brief opposing the Trump Administration’s plans to ban open military service by transgender individuals. The amicus brief, filed with the U.S. District Court for the District of Columbia for Doe v. Trump, argues that banning transgender individuals serving in the military is unconstitutional, against the interest of national security, and harmful to the transgender community at large. On November 21st, a federal court ordered a halt to President Donald Trump’s order barring openly transgender people from serving in the military. On December 23rd, the DC Circuit denied the Administration’s motion for a stay of the district court’s order. Civil Rights and Immigration (ICE FOIA Lawsuit): On October 17th, OAG joined a coalition of 10 AGs in filing a lawsuit against the U.S. Department of Homeland Security for failing to disclose records concerning the detention and deportation of immigrants. This lawsuit follows a similar, unfulfilled FOIA requests for information sent by the same AGs in June 2017 to several law enforcement agencies. Environmental Protection (Flood Protection Letter to Congress): On October 18th, OAG, leading a coalition of AGs from CA, IL, IA, MD, and DC, sent a letter to House and Senate leaders urging them to enact updated federal flood protection standards that would be applied to federally-funding recovery and rebuilding projects in flood-prone areas. Gun Safety (Concealed Carry Reciprocity): On October 23rd, OAG led a coalition of 17 AGs in sending a letter to Congress explaining the states’ forceful opposition to the Concealed Carry Reciprocity Act of 2017. OAG’s letter argued that the ill-conceived legislation would override local public safety decisions and endanger communities and police. On December 6th, OAG issued a statement denouncing the Concealed Carry Reciprocity Act of 2017 after the House passed it. Environmental Protection (Coal Subsidies — Grid Resiliency Pricing Rule): On October 23rd, OAG filed comments with the Federal Energy Regulatory Commission (FERC) opposing the Department of Energy’s proposal to subsidize coal-burning power plants. Reproductive Rights (Garza v. Hargan): On October 24th, OAG led a coalition of 14 AGs in filing an amicus brief with the D.C. Circuit in support of Jane Doe, a 17 year-old unaccompanied minor immigrant who was in federal custody and sought an abortion. OAG’s amicus brief followed its letter to HHS’ Office of Refugee Resettlement (ORR) on October 20; that letter urged ORR, who had custody of Jane Doe, to release her and permit her to access abortion services. Student Loans (Student Loan Servicer Preemption): On October 24th, OAG led a bipartisan coalition of AGs and officials representing 25 states in sending a letter to Secretary Betsy DeVos urging the Department of Education to reject the campaign by student loan servicers and debt collectors to dismantle state oversight of the student loan industry. Environmental Protection: On October 26th, OAG filed a notice of intent to sue the EPA for violating the federal Clean Air Act by failing to curb smog pollution that blows into New York from upwind states. LGBT Rights (Masterpiece Cakeshop v. Colorado Civil Rights Commission): On October 30th, OAG joined a coalition of 20 AGs in filing an amicus brief with the U.S. Supreme Court defending the constitutionality of Colorado’s public accommodations law, arguing that a business owner’s personal beliefs do not give him or her the right to discriminate against customers. The brief was filed with the U.S. Supreme Court in the case of Masterpiece Cakeshop, Ltd. v. Colorado Civil Rights Commission. Reproductive Rights (ACA Contraception Mandate Lawsuit): On November 2nd, OAG joined a federal lawsuit to protect New Yorkers’ access to birth control, following the issuance of two Interim Final Rules (IFRS) from the Trump administration rules that deny contraceptive access be allowing employers to claim greatly expanded exemptions to the Affordable Care Act’s contraception mandate. On November 9, 2017, OAG joined the same coalition in filing a petition for a nationwide preliminary injunction; that case is captioned California v. Hargan et al. Civil Rights and Immigration (Travel Ban 3.0): On November 17th, OAG led a coalition of 16 AGs in filing an amicus brief in opposition to President Trump’s third travel ban. The amicus brief was filed in support of the plaintiffs in IRAP v. Trump and urged the Fourth Circuit Court of Appeals to affirm the nationwide preliminary injunction that was issued by the district court. Net Neutrality (Fake Comments): On November 21st, OAG sent an open letter to FCC Chairman Ajit Pai following numerous requests for assistance in an OAG investigation into the misuse of New Yorkers’ identities to comment for or against an FCC proposal to rescind Obama-era net neutrality rules. On November 29th, OAG created a webpage for New Yorkers (and anyone else) to search and discover whether their identities were misused to file public comments with the FCC. On December 4th, OAG held a press conference with FCC Commissioner Jessica Rosenworcel to call on the FCC to cooperate with OAG’s investigation and to halt the rulemaking process, which appeared to have been corrupted by the filing of millions of fake comments. Environmental Protections (Clean Power Plan — EPA Agency Action): On November 28th, OAG issued a statement while the EPA held its then-only hearing on its proposed repeal of the Clean Power Plan in West Virginia. On October 31st, OAG urged the EPA to hold a public hearing in New York. On November 29th, OAG testified at the West Virginia hearing on the repeal of the Clean Power Plan and highlighted why New York is a staunch defender of the Clean Power Plan. Civil Rights and Immigration (Travel Ban 3.0): On November 28th, OAG led a coalition of 16 AGs in filing a new amicus brief with the U.S. Supreme Court, opposing President Trump’s third travel ban and his administration’s application for a stay of a preliminary injunction halting enforcement of that ban. Ground Level Ozone (Smog): On December 5th, OAG led a coalition of 15 AGs in filing a lawsuit in the Northern District of California against EPA for illegally delaying designations of ground-level ozone (smog) in violation of the Clean Air Act and the Administrative Procedure Act. Reproductive Rights (ACA Contraceptive Coverage Mandate Public Comments): On December 6th, leading a coalition of 16 AGs, OAG filed public comments with the Department of Health and Human Services opposing the Trump Administration’s interim final rules that roll-back birth control coverage. The comments oppose the same rules that several attorneys general, including OAG, challenged in federal lawsuits filed in numerous venues. Environmental Protection: On December 14th, OAG, along with Governor Cuomo, announced its intent to sue the EPA if the agency accepts the Upper Hudson River dredging of PCB (polychlorinated biphenyls) as complete. Environmental Protection (Clean Water Rule): On December 15th, OAG led a coalition of 11 AGs in challenging the EPA’s illegal delay of the Clean Water Rule, a federal regulation that defines the “waters of the United States” under federal law. Environmental Protection (Clean Power Plan — EPA Agency Action): On December 15th, OAG and the Mayor’s Office announce their offices will hold a “People’s Hearing” in New YOrk City on January 9th on the Clean Power Plan to ensure New Yorkers’ voice are heard. Reproductive Rights: On December 18th, OAG led a coalition of 12 AGs in telling the Trump administration it has no authority to block two young immigrant women in federal custody from obtaining abortions. Net Neutrality: On December 15th, AG Schneiderman announced that he will lead a multistate lawsuit to stop the rollback of the net neutrality rules that ensure a free and open internet. Official Medium account of the New York State Attorney General's Office.